It was common for barbershop songs of the day to drift into “minstrel or vaudeville shtick,” DS but the Haydn Quartet, who scored their sixth #1 with “Sweet Adeline”, generally stuck to more straightforward harmony. DS The song was the biggest hit of 1904. WHC The Columbia Quartet and the duo of Albert Campbell & James F. Harrison also charted with versions that year, taking the song to #1 and #2 respectively. The Mills Brothers had a top 10 with it in 1939. 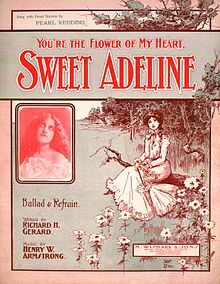 The song also became identified with Boston Mayor John F. “Honey” Fitzgerald PM who used it as his campaign song in 1906.